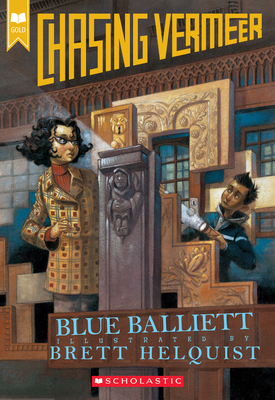 Chasing Vermeer joins the Scholastic Gold line, which features award-winning and beloved novels. Includes exclusive bonus content! When a book of unexplainable occurences brings Petra and Calder together, strange things start to happen: Seemingly unrelated events connect; an eccentric old woman seeks their company; an invaluable Vermeer painting disappears. Before they know it, the two find themselves at the center of an international art scandal, where no one is spared from suspicion. As Petra and Calder are drawn clue by clue into a mysterious labyrinth, they must draw on their powers of intuition, their problem solving skills, and their knowledge of Vermeer. Can they decipher a crime that has stumped even the FBI? Blue Balliett is the author of several bestselling, acclaimed mystery novels, including Hold Fast, Chasing Vermeer (a Book Sense Book of the Year and an Edgar Award winner), The Wright 3, The Calder Game, and The Danger Box. She writes in the laundry room of her home in Chicago, Illinois, and you can find her online at blueballiettbooks.com. Brett Helquist was born in Ganado, Arizona, and grew up in Orem, Utah. He entered Brigham Young University as an engineering major, but soon realized this was not the right choice for him. Having decided to take time off from college, he headed to Taiwan where he stumbled into a job illustrating English textbooks, which he enjoyed. There, a friend introduced him to an illustration student, also from Brigham Young University. This introduction inspired Brett to eventually switch majors. After spending a year in Taiwan, he went back to BYU and transferred to the illustration department. In 1993 he received a fine arts degree in illustration.